professionals who work to further the goals of the Campbell Institute of the National Safety Council. (For more information on the Campbell Institute, visit www.thecampbellinstitute.org.) He worked for four decades at General Motors, most recently as director of global safety programs. companies that have participated in the past. This could be considered the tipping point as to whether an organization has achieved world-class safety status, he said. culture in place, but loss of it can occur overnight (e.g., a change in leadership with reduced focus on safety). embedded in how an organization does business. with all other objectives, strategies and values in an organization. both the community and employees outside of work. Recommendation No. 2006-1-H-R1, issued pursuant to the CSB's Combustible Dust Study. Recommendation No. 2008-5-I-GA-R11, issued pursuant to the CSB's Imperial Sugar Investigation Report. Recommendation Nos. 2011-4-I-TN-R1 and R2, issued pursuant to the CSB's Hoeganaes Case Study. At the conclusion of the meeting CSB Board Members are expected to designate an OSHA general industry standard for combustible dust as the CSB's first “Most Wanted Chemical Safety Improvement” issue. 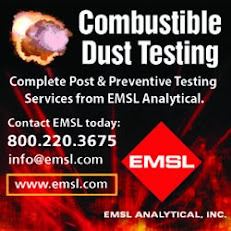 Live Demonstrations at Combustible Dust Testing Lab in conjunction with Two-Day combustible dust workshop July 25-26 North Cinnaminson, New Jersey. Course objectives- the combustible dust hazard workshop will provide the basic knowledge in identifying, evaluating, and controlling combustible dust hazards. Topics include recognizing fire and explosion hazards, ignition sources in operations, isolation engineering controls, laboratory testing for ignition and explosive severity, best industry practices and administrative controls for prevention, and conducting a facility hazard assessment. Who should attend: management, health and safety, and maintenance personnel in industries with combustible dust hazards including food, grain, wood, pulp, paper, plastics, pharmaceutical, rubber, metals and fossil fuel power generation. Go – No Go Testing (Explosive Screening) – ASTM E1226This is an economical and practical way to determine if the dust in the sample has the potential to be explosive. Testing consists of exposing the fine dust in the sample to low energy igniters inside the 20-Liter Siwek explosion chamber and determine the explosion over pressure. If the dust is not found to be an explosive threat, the analysis can be aborted to avoid unnecessary fees. If the sample turns out to be explosive on the screen testing, the more comprehensive analyses listed below should be conducted. Explosion Severity (Kst, Pmax, [dP/dt]max) – ASTM E1226This testing provides an indication of the severity of the dust explosion by determining the deflagration parameters. The larger the value of Kst, the more severe the explosion is. For this test, the dust is suspended and ignited in the Siwek chamber and the maximum pressureand the rate of pressure rise are measured. Minimum Explosion Concentration (MEC) – ASTME1515MEC is the minimum concentration for explosivity of a combustible dust cloud. It is determined by suspending the dust in the Siwek Chamber. Minimum Ignition Energy (MIE) – ASTM E2019MIE is the electrical energy discharged from a capacitor, just sufficient to produce the ignition of the most ignitable mixture of air and dust. It is determined by suspending the dust in a Hartmann Lucite explosion chamber. Minimum Ignition Temperature Test (MIT) – ASTM E1491 (dust cloud)ASTM E2021 (dust layer)This test method covers the minimum temperature at which a dust cloud will autoignite when exposed to air and heated in a furnace at atmospheric pressure. It is determined by introducing the dust into a BAM oven. As an alternative, the minimum temperature of self-ignition of dust layer can be measured using a hot plate set-up. Class II TestingThis level of testing involves a number of parameters that determine if the sampled dust is considered a Class II hazardous material. Class II locations are defined as locations with combustible dust having Ignition Sensitivity (I.S.) greater than or equal to 0.2 or Explosion Severity (E.S.) greater than or equal to 0.5. I.S. is calculated from MIT, MIE, and MEC for the sample normalized to Pittsburg coal dust, whereas E.S. is calculated from Pmax and[dP/dt]max for the sample, also normalized to Pittsburg coal dust. Resistivity Testing (for metal dust in particular)The resistivity testing is particularly important for metal dust. The electrical nature of the dust is one criteria to determine if it is necessary to take special precaution with regard to electrical insulation of the equipment operating in a location with Class II dust. Since the 2009 introduction of OSHA’s proposed combustible dust rulemaking following the 2008 Imperial Sugar Refinery catastrophic dust explosion, a regulation has not been finalized. In the interim, Congress has acted with the February 2013 reintroduction of a proposed combustible dust bill, “Worker Protection Against Combustible Dust Explosions and Fires Act (H.R. 691),” which directs OSHA to immediately publish an interim combustible dust regulation. A problem arises in both the proposed OSHA combustible dust rulemaking process and reintroduced combustible dust bill in that neither acknowledges the multitude of “near miss” combustible dust related fires, precursors to catastrophic dust explosions and flash fires. 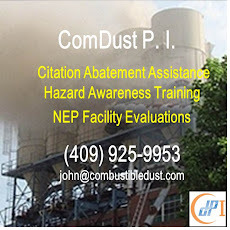 In 2013 a preliminary analysis by the Combustible Dust Policy Institute (CDPI) of National Fire Incident Reporting System (NFIRS) 2011 data provided by the National Fire Data Center at the U.S. Fire Administration indicated over 500 combustible dust related incidents. The majority of these incidents are “near miss” fires in the manufacturing and non-manufacturing sectors with dust, item first ignited. This webinar will provide valuable information on how partnering with the nation’s fire service assists facility owners, managers, and OHS professionals in identifying combustible dust hazards, preventing incidents, and reducing liability. The presenters will discuss the fire service’s response to the prevalence of repeatable “near miss” combustible dust-related fires occurring throughout U.S. industry. When milling, machining, polishing, grinding, or drilling materials such as Titanium, Magnesium, Aluminum, Iron Oxides, Stainless Steel, and Carbon Fiber, manufacturers must address the inherent explosion and fire hazards associated with the combustible dust generated by these materials. An overall system solution must address the process requirements, materials, and the volumes processed. All equipment in contact with hazardous / combustible dusts must be constructed in compliance with HazLoc Class II disciplines, and applicable N.F.P.A., A.N.S.I., and A.S.M.E. standards. Customized systems are usually application specific and sized appropriately for the collection, conveyance, and control of the materials, ratios, and anticipated volumes of debris to be recovered. A basic understanding of the issues and solutions as relate to current developments in systems configurations, and best industry practices requires an explanation as to how catastrophic events occur. In the interest of enhanced worker and plant safety we will also review what can be done to prevent them. Combustible dust related fires occur in all cases as a result of combustible materials being exposed to an ignition source. This can occur either during or subsequent to machining when materials are within ignition sensitivity levels capable of supporting a deflagration. When being transferred for collection, combustible dusts can also impact duct work elbows and other constrained joints and as a result of high speed impact create a spark moving the ignition source toward a collection point. Non-grounded components accumulating an electrostatic charge, exposure to electrical motors or other spark producing equipment can also provide an ignition source. If an ember or spark is eventually transferred to a collection location and maintains ignition energy it can initiate a further transfer of the ignition to additional materials in the process stream. Layers of dust which have accumulated over time have also been documented as transmitting an initial deflagration to secondary areas. In a worst case scenario if suspended as a dust cloud, explosions are easily generated as the deflagration gains rapid expansion due to the increase of combustibles. 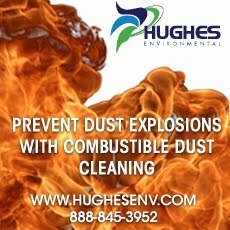 Dust explosions occur when combustible materials are suspended in an air/fuel concentration consistent with rapid ignition transmission. If the initial deflagration generates even a primary explosion, the associated shock waves will dislodge any dusts which have accumulated over time on overhead beams, walls, duct work, machinery, or collection vents. When these materials are dislodged from their resting place, they become airborne and in the presence of the initial flame front ignition source presented by the initial deflagration, they will contribute to an even much larger secondary catastrophic explosion. Incidents reported in recent years here in the U.S. have documented multiple deaths, injuries, and significant property destruction. S.D.S. (SAFETY DATA SHEETS) seldom refer to the inherent danger of finite dust particles generated during machining processes. They fall short by NOT expressing the M.I.E. (Minimum Ignition Energy) and minimum ignition temperature (MIT) thresholds and seldom address the issue of reactivity with other materials. In some industries such as aerospace, there are usually several materials in a waste stream. As an example, drilling and assembling aircraft structures will generate carbon fiber, titanium, aluminum, and stainless steel in varying combinations. These comingled materials lead to secondary handling issue that S.D.S. specifications don’t address. Using one collection system for recovering different materials from diverse operations should be evaluated by sample testing to determine if a volatile combination of materials with lower MIE than each by themselves may be present. Housekeeping, provides increased worker and plant safety but usually adds to the overall cost of manufacturing operating expenditures. Safely removing accumulated combustible dusts requires specialized equipment and in some cases access can only be achieved if entire production areas are shut-down. As a result, cleaning activities are not performed as frequently as they should be thus increasing the risks associated with accumulated combustible dusts. To minimize personal risks, efforts should include materials safety awareness, safe handling protocols and training. For example, using plant compressed air to “blow-off” debris from recessed areas should be avoided as the resultant dust in suspension could easily propagate an explosion under the right conditions. When dealing with any of the debris generated within the production waste stream, one of the first steps must include combustible dust testing of the materials for explosive severity and ignition sensitivity as they would be generated in the work environment. Sample collection(s) and submittal to an independent laboratory for testing under N.F.P.A. Code 68 is essential. Data received from such test results is mandatory when designing fire prevention and explosion protection equipment and process systems with sufficient capacities to safely accommodate subsequent collection, conveyance, and containment of the materials being recovered. Current systems have incorporated both high volume air flow AND high vacuum to optimize collection efficiencies and transfer capabilities of heavy combustible dusts. The ability to collect and control the transfer of any debris or dust is related directly to the volume, size, weight, specific gravity, and surface area of the material to be addressed. Vacuum in itself provides no means to act upon any material unless there is substantial air volume available to generate the motive force behind transfer. Dust collectors generally rely upon large volumes of air flow and as a result impart minimal vacuum on materials to maintain their velocities in collection ducts. Collect dust as it is being generated. Hazardous dust migration in many cases has been eliminated by using specialized high volume – high vacuum / dust recovery systems to collect debris simultaneous to generation further containing the recovered materials and minimizing the burden of house-keeping. Within the aerospace industry, complete recovery of drill chips and dust at the work piece is currently in use on several projects and in automotive applications, debris recovery has been accomplished within assembly and machining operations with the same process. Many terms apply to the initial separation of the combustible dusts from the recovering air stream such as Vortex, Centrifugal, or Gate type systems. Initial contact between recovered dusts and the receiving receptacle act to slow the materials in the air stream such that heavy materials drop out of the airstream before contact with any filtering media. 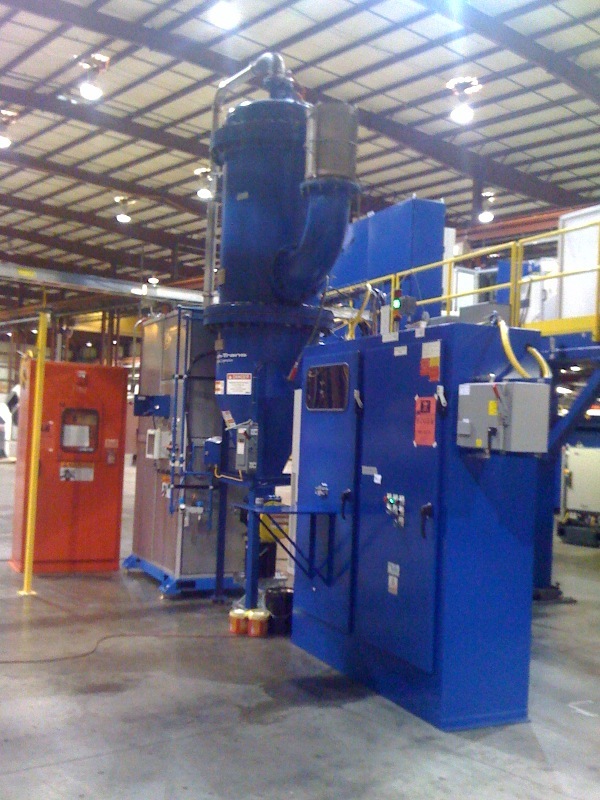 General dust collectors employ filter “bag-house” configurations with high pressure air jets to back flush the filters on occasion to maintain collection capabilities as the finer materials in these type systems have a tendency to migrate into the filter media. Rotary valves or gates at the bottom of the recovery receptacles allow recovered materials to be collected for disposal. Items which may have been considered as “OPTIONAL” in the past should be considered as MINIMAL requirements in systems collecting and conveying combustible dusts in compliance to HazLoc Class II. Terminology may differ between industries and suppliers however the intent to which these are applied remains consistent with providing safety in the work place. Author: J. Byron Walker is Director for Systems Design and Engineering @ TECH TRANS UNLIMITEDCORP. He has over 35 years of experience in Robotics and automation systems integration working in the automotive, aerospace, and electronics industries. He holds patents in finite parts cleaning technologies and is responsible for providing total systems solutions for the safe recovery and transfer of Hazardous Materials to which this article is directed. Full-day Combustible Dust Hazard Awareness Seminar. May 16, 2013, Northcentral Technical College, Wausau, Wisconsin. Workplace combustible dust related fires and explosions occur with alarming regularity throughout the global grain, mining, manufacturing and non-manufacturing sectors. Historically, many of these non-consequential incidents have escalated into catastrophic events. Subsequently, this educational seminar will provide stakeholders with the basic knowledge and skills in minimizing the probability of occurrence and severity of consequence of future combustible dust related incidents in addition to maintaining OSHA regulatory compliance.